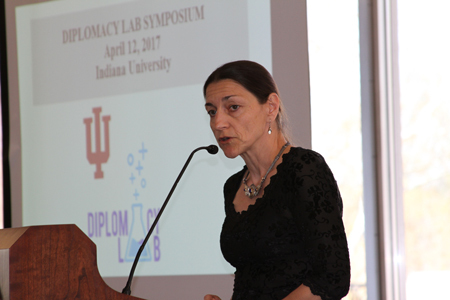 “Foreign policy is much broader than what some people might think,” noted School of Global and International Studies Dean Lee Feinstein in his welcoming remarks to those gathered for the inaugural Diplomacy Lab symposium in the Indiana Memorial Union Solarium Wednesday, April 12. But current thinking about preventing war and tackling other pressing global issues, Feinstein suggests, encompasses an array of considerations. “Food security, for example, is not a boutique item,” the dean noted, when it comes to global stability. Developed in departments ranging from Jewish Studies to Earth and Atmospheric Sciences, student projects spotlighted at the event bore out this multi-pronged approach to foreign policy. Representing eight courses in five different schools across the university, the projects “span continents and disciplines,” explained Olga Kalentzidou, director of academic initiatives and experiential learning at SGIS, and the institutional coordinator for Diplomacy Lab. The symposium marked the second semester of the university’s collaboration with the Department of State. IU is one of 28 universities across the country with whom the federal agency has partnered as part of Diplomacy Lab. The initiative, begun in 2013 by then-Secretary of State John Kerry, follows out of the agency’s mandate to engage the American public in the diplomatic process, and broaden the source of ideas beyond Washington. SGIS serves as the IU project’s administrative hub. 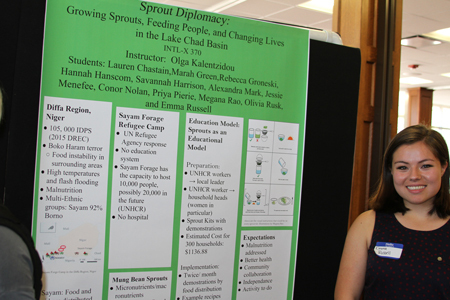 SGIS sophomore Emma Russell and fellow students in Kalentzidou’s course (INTL-X 370, Food Security) built their Diplomacy Lab project on the nutritional potential of mung bean sprouts. “Sprouts are a nutrient powerhouse,” Russell explained in her pitch for “Sprout Diplomacy: Growing Sprouts, Feeding People and Changing Lives in the Lake Chad Basin.” “Plus, they’re easy to grow, they’re portable, and they’re inexpensive,” the International Studies major elaborated. The project proposed that a mung bean sprouting kit might round out nutritional needs for the 10,000 internally displaced people living in a camp in the Diffa Region of Niger. 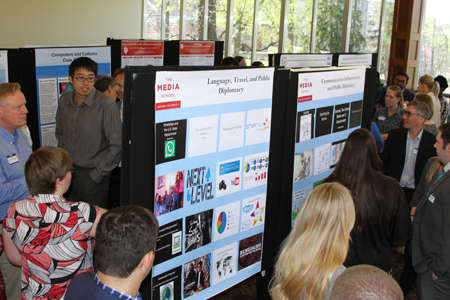 The student teams presenting pitches and posters at the symposium worked on their Diplomacy Lab projects all semester within courses built in response to State Department proposals. IU professors and their students tackled eight “proposal bids” this semester; there were three in development during fall 2016. By the end of the semester, the teams will submit final deliverables to the federal agency in the form of research papers, media presentations, and policy recommendations, Kalentzidou explained. This foray into “course-sourced” diplomacy represents the State Department’s conviction that “solutions do not all reside in top-down decision-making,” as Michael Hamburger noted in his keynote address. Professor of Earth and Atmospheric Sciences, Hamburger proposed bringing Diplomacy Lab to IU in the spring of 2016 during his year as a Jefferson Science Fellow at the Department of State. Hamburger’s own experience within the agency’s Office of Religion and Global Affairs speaks to the importance of casting a broad net when it comes to eliciting solutions for diverse problems. As a scholar of seismotectonics, Hamburger’s office assignment at State seemed--even to him--to be a mismatch. But there was a connection to explore. Although earthquakes happen as a result of continental collision, the ensuing casualties can vary widely depending on where the shaking occurs. “It’s really a human story,” Hamburger asserted in his presentation. Earthquakes of the same magnitude might take 1000 times as many lives in Pakistan as in the West. Studying the 2005 Kashmir Earthquake, Hamburger joined his expertise with those in Pakistani scientific and educational communities to explore how the high human toll of future natural disasters might be reduced by engagement with religious communities in Pakistan. Presentations of this semester’s Diplomacy Lab projects at the symposium also examined social, cultural, and religious mores in tackling the world’s crises and conflicts. Studying the Syrian refugee crisis in Italy, students in Rajendra Abhyankar’s course in the School of Public and Environmental Affairs (SPEA V550 Practice of Diplomacy) encountered the hurdles to refugee integration that existed within the mindset of the southern European nation’s relatively homogeneous, aging population. Ojo, who is from Nigeria, and her Diplomacy Lab project team—a multi-national contingent representing Brazil, India, Croatia, and beyond—discovered that convincing the private sector of the economic advantage to assimilating refugees into Italian society was key to pushing for policy change. 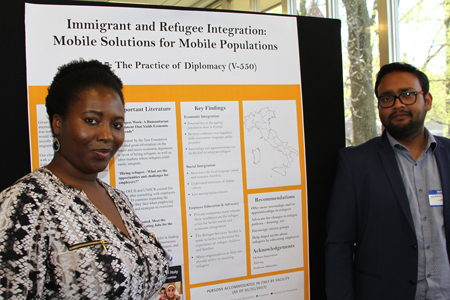 In compiling their project, “Immigrant and Refugee Integration: Mobile Solutions for Mobile Populations,” they consulted regularly with an officer at the American Embassy in Rome. They sought out additional advice from the Tent Foundation, which explores entrepreneurial approaches to the global refugee crisis. Students in the Media School produced multiple projects exploring the role media can play in public diplomacy. Within Julien Mailland’s course, “The Role of Technology in International Relations” (MSCH-M413), students explored the potential of existing social media platforms to serve as international connective tissue for a younger generation. The project “Traveling with YouTube,” for example, would equip prominent YouTube personalities with State Department talking points that might enhance international relations in an informal, grassroots way.